The only way to fully appreciate the scale is from above. Well, that or actually splashing around in it. Too dark for 9 more? Lights are on at the 30-acre driving range. Stroll by the slips and make up fun names for your family favorites. Private balconies offer an opportunity for peace and quiet. Shop, eat and have a good time at Barefoot Landing. Barefoot Resort & Yacht Club is located in Myrtle Beach, along the Intracoastal Waterway. After getting settled in your condo rental, change into swimsuits, grab goggles and pool toys, slather everyone head to toe in sunblock. Get ready to hit the large freeform pool – it’s the largest in South Carolina. Set up camp in a poolside lounger with your latest beach read. I have a feeling that you’re going to be here for a while. The Barefoot Resort has 4 golf courses on-site, plus a 30-acre lighted driving range. Round up the golfers in your crew and go for it. But that’s not all! The resort also offers tennis, volleyball and basketball courts and the on-site marina has water sports rentals available. Individually decorated two- and three-bedroom villas sleep six to eight guests. Upgrade to a two-bedroom condo for more space or a three-bedroom condo for an extra bathroom. Four-bedroom condos sleep ten guests. Stop by the Super BI-LO for groceries – your full kitchen won’t stock itself. Recruit the little ones to help bake chocolate-chip cookies (not that they’ll need convincing). You’ll be thankful for the in-suite washer/dryer in case things get messy. Throw in a quick load of laundry while you watch a Big Bang Theory rerun on the Cable TV. Barefoot Landing is just across the Intracoastal Waterway and features a variety of shopping and dining. Get a new pair of shades at Sunglass Hut. Barefoot General Store features specialty food products along with Myrtle Beach souvenirs. Looking for a unique gift? Best Gift Idea Ever has you covered. They are known for their Letter Art which is made up of photos that feature letters found in everyday objects. Grab a burger at House of Blues, feast on seafood at Joe’s Crab Shack or build your own pizza at Ultimate California Pizza. 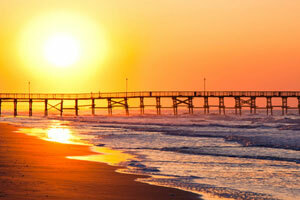 Barefoot Resort & Yacht Club offers a seasonal shuttle to the Myrtle Beach Boardwalk. Go for a ride on the Myrtle Beach SkyWheel. At almost 200 feet tall, the SkyWheel is an exciting adventure that’s fun for all ages. Ripley’s Odditorium displays the personal collection of strange artifacts owned by Robert Ripley, the creator of the “Believe It or Not” cartoons. The Children’s Museum of South Carolina has several interactive exhibits that allow children the freedom of using their imagination while expanding their mind at the same time. They will have so much fun that they won’t even realize that they are learning. - The front desk is open 7:00 AM - 11:00 PM daily. The check-in location differs from the property location. To check in, go to 4403 Highway 17 South, North Myrtle Beach, SC 29582-5254. In order to check in after hours, guests must pay a damage waiver fee or have USD 100.00 put on hold on their credit card. Afterward, they will receive a code to a lock box located outside the front desk office with keys to the unit. Guests planning to arrive after hours must contact the property at least 48 hours prior to arrival using information on the booking confirmation. - The parking of motorcycles, campers, boats, trailers, and/or commercial vehicles is strictly prohibited on site.